Tega Cay, SC Homes by Price Range – Below are price range tables for subdivisions in Tega Cay, South Carolina, a small community located near Rock Hill, SC and southwest of Charlotte. Travel south on Interstate #77and exit west at Exit #88 (Gold Hill Road) and proceed four miles to Tega Cay town center. 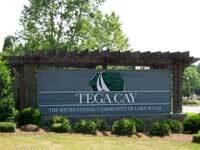 Tega Cay is 20 miles from “Up Town” Charlotte in York County South Carolina. A broader and more advanced area search for homes and real estate in the Lake Norman and Metro Charlotte region can be done here or see our city directory towns surrounding Charlotte.